Getting into blockchain development can be pretty intimidating. There’s a whole host of weird terms that are thrown around like “coinbase” and “merkle root” that not only look odd, but are not obvious. Add to that additional terms that look normal, but mean something specific to blockchain like “transaction”, “block” and “signature”. In this series of articles, I aim to give you a gentle introduction into the world of blockchain development, or what I call “Blockchain 101". It sounds like a university course and it’s meant to be about at that level. You can read the posts here and get something out of them, but to get the full benefit, take time to do the exercises so you can really get an understanding of what’s going on. In today’s article, we’re going to start on the foundational math. 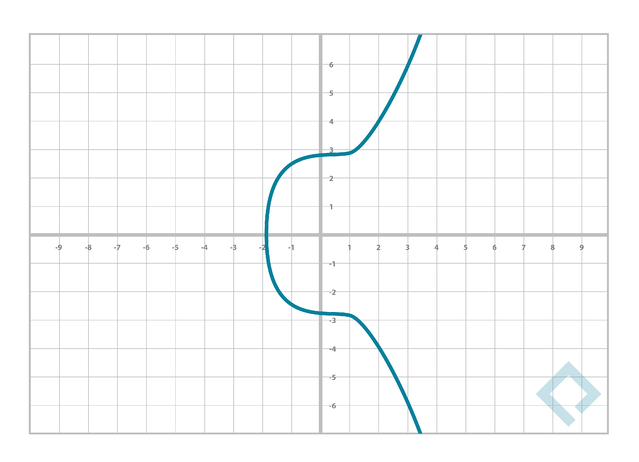 Our goal is to get you comfortable with finite fields and elliptical fields, which is a prerequisite to elliptical curve cryptography - the math behind blockchain. 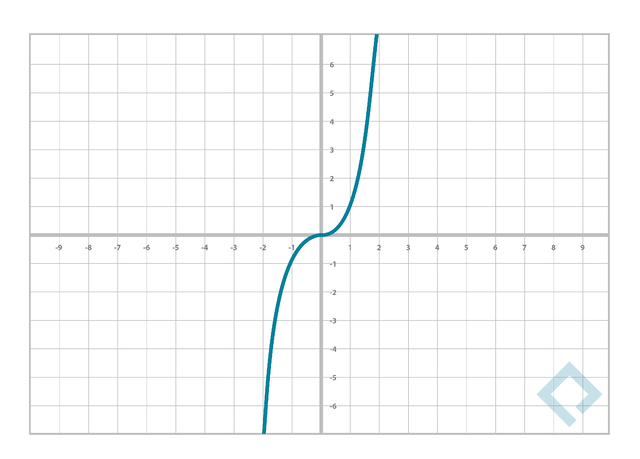 Finite fields are an important construct in mathematics and especially important in computer science. Think of them as a set of integers. When you take any two numbers from this set and add them, you get another number from the set. Same thing with subtraction, multiplication and division by anything other than 0. It may seem strange that you can divide two integers and come up with another integer, but that’s part of the magic, especially when you have a finite set. As you can see, there are exactly 19 elements in this field that consists of every number between 0 and 18, inclusive. For various mathematical reasons, it turns out fields that have a prime number of elements are the most interesting, which is why we chose 19 here. The field of order 19 is denoted F19. Fields of other orders are denoted with the number as the subscript. We now have to define addition and subtraction so that adding any two elements or subtracting any two elements results in another element in this set. We can do this with modulo arithmetic using the order of the prime field (19). As you can see, no matter which two elements we select from F19 we will always end up with another element in F19. 29 - 4 = ? 17 + 21 = ? 15 - 30 = ? Again, we can multiply any two numbers from F19 and end up with another number in F19. Note we end up with some counter-intuitive results, like 7*3=2 and 11*11=7. Don’t worry too much about that, as finite field math can be a bit counter-intuitive, coming from the world of normal multiplication. 24 * 19 = ? 173 = ? 55 * 18 = ? 2. Write a program to calculate 1*k, 2*k, 3*k, … 30*k for some k in F31. Notice anything about these sets? 3. Write a program to calculate k30 for all k in F31. Notice anything? Answers: 1. 22, 15, 16; 2. The sets are all equal to F31; 3. k30 is always 1. One quick note before we leave multiplication. The answer to #2 above is why we choose prime fields. The numbers in a prime field are basically equivalent whereas in a composite field, the set 1*k, 2*k, 3*k…(n-1)*k wouldn’t necessarily be equivalent to the field itself. 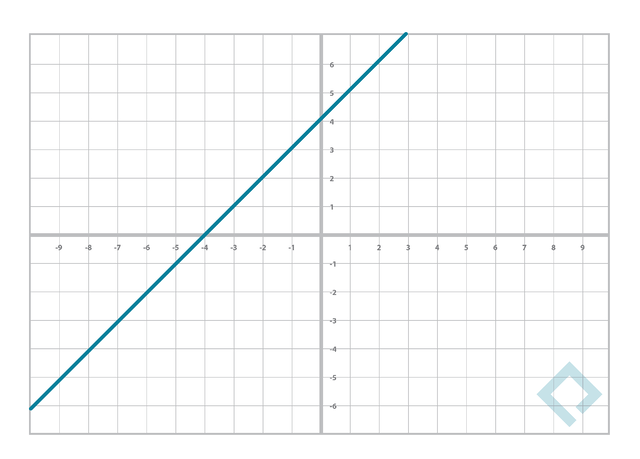 Division, in finite field mathematics, is simply defined as the inverse of multiplication. As with multiplication, we have some really counter-intuitive results like ⅔ = 7, ¾=15 and 7/11=11. Once again, finite fields are somewhat counter-intuitive so please don’t worry about the weirdness of the results, but just how to calculate them. The more salient question is, how do we do the actual calculation? This is a beautiful result from number theory known as Fermat’s Little Theorem. If you care to convince yourself this is true, there’s a very interesting proof using necklaces in the Wikipedia article. This can help us learn how to do field division. 3 / 24 = ? 17-3 = ? 4-4 * 11 = ? 2. Write a program to calculate k/1, k/2, k/3, … k/30 for some k in F31. Notice anything about these sets? 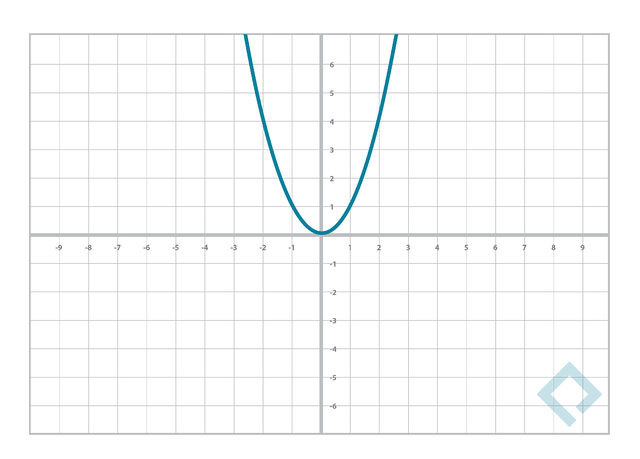 Notice that it’s less steep than the cubic or quadratic curves. Notice also that it’s a mirrored over the x-axis. This is because the left side of the equation is y2, making it so that if y is a solution -y is also a solution. 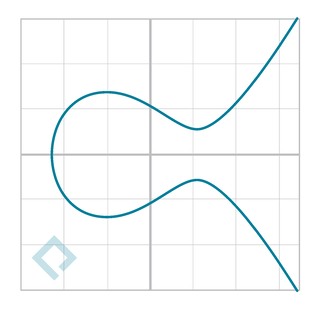 Now elliptical curves have an interesting property that we can define as point addition. 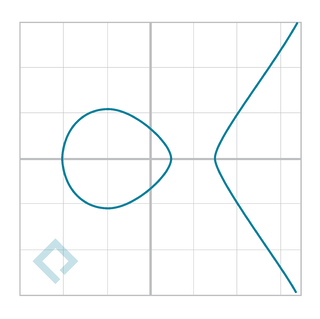 Point addition stems from the fact that a line defined by two points on this curve will intersect the curve a third time. Essentially, the operation is as described in the diagram above. 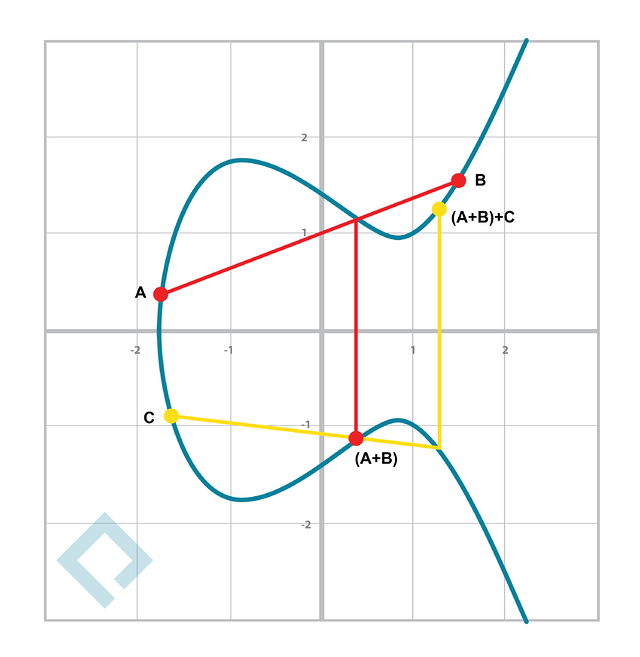 To add P and Q, you find the third intersection point, then you reflect over the x-axis. 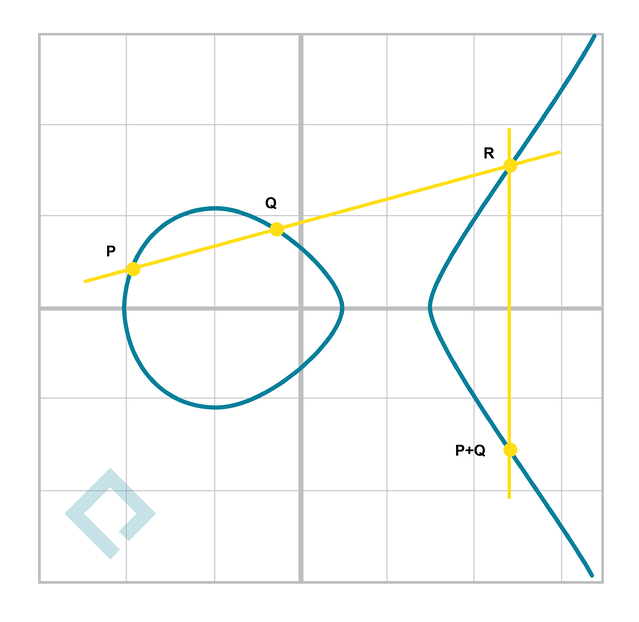 Verify this point is on the curve. 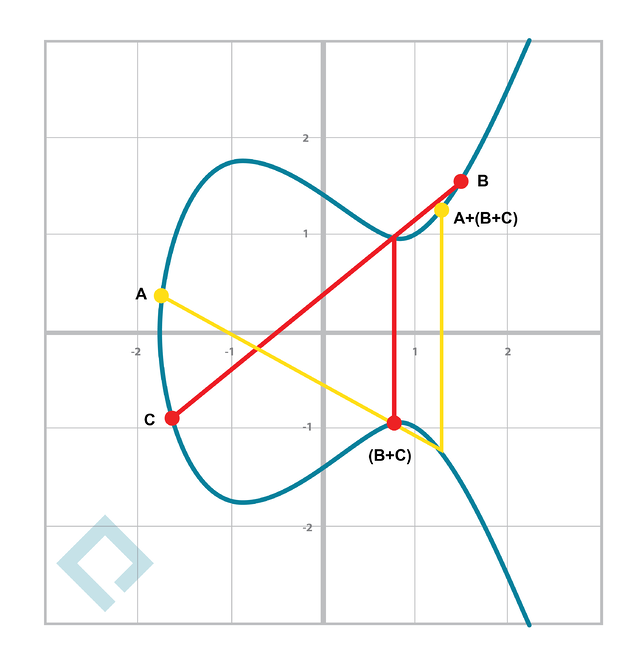 We’ve covered Finite Fields and Elliptical Curves. They may seem unrelated, but next time, we’ll combine them to produce a very powerful cryptographic tool called Elliptical Curve Cryptography. Interested in working with these technologies (and more)? Join us!